Three houses had to be evacuated because they could collapse after a huge 25ft wide sinkhole opened up in a street in North Yorkshire. Police cleared the homes on Magdalen's Close in Ripon at 5.40pm on Monday after receiving reports the huge sinkhole had appeared. Officers carried out house-to-house checks in the area to warn people close to the area. Police, fire crews and the ambulance service were at the scene with structural engineers and mining experts. North Yorkshire fire and rescue service said that a fire engine and a heavy rescue unit from Ripon were at the scene, where cracks had appeared in the ground, damaging to a building. A spokeswoman said: "There are no occupiers in the property and a dog has been successfully rescued. Residents from adjacent properties have been evacuated as a precaution." Local resident 34 year old Barry Dyason, said: "Most of the people from the emergency services seem to have gone now, it's mainly people from the utility companies who are still there. 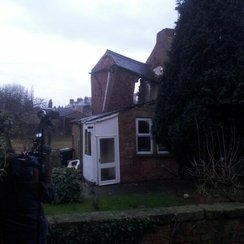 "You can't see the sinkhole because it's between a house and two cottages - it's one of the cottages which was damaged. "This area is quite well known for gypsum deposits, and there have been properties affected by subsidence - but not sinkholes, that I've heard of."